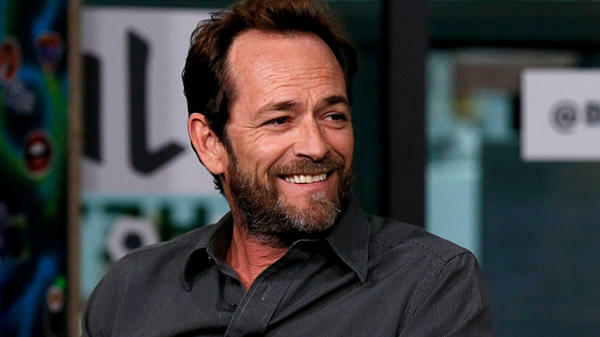 Luke Perry, seen here last October during a press appearance for the TV series Riverdale, has died following a massive stroke, his publicist said Monday. Luke Perry, who rose to fame as bad-boy Dylan McKay on the TV series Beverly Hills 90210, has died at age 52. Perry's publicist announced Monday that the actor "passed away today after suffering a massive stroke" in Los Angeles. Perry reportedly suffered a stroke last Wednesday, when TMZ and a number of media outlets reported that an ambulance took him from a house in Sherman Oaks, Calif., to a hospital. When he died, Perry "was surrounded by his children Jack and Sophie, fiancee Wendy Madison Bauer, ex-wife Minnie Sharp," and other close relatives and friends, his publicist said. News of Perry's death immediately triggered tributes and condolences from other celebrities, including Molly Ringwald, who said via Twitter, "My heart is broken. I will miss you so much Luke Perry. Sending all my love to your family." Perry's failing health prompted emotional comments from one of his former costars Sunday night, when Shannen Doherty, who starred alongside Perry on 90210, told Entertainment Tonight, "I can't talk about it [here] because I will literally start crying. But I love him and he knows I love him." "It's Luke, and he's my Dylan," Doherty added, speaking at an event for the Animal Hope and Wellness Foundation. "The family appreciates the outpouring of support and prayers that have been extended to Luke from around the world, and respectfully requests privacy in this time of great mourning," Perry's publicist said. While Perry was best-known for playing a teenager, he was in his early 20s when he joined the cast of Beverly Hills 90210 in 1990. In the years since, he also had recurring roles on a number of other shows, from OZ to Riverdale. In a statement, the makers of Riverdale called Perry a "beloved" member of their team who was "everything you would hope he would be: an incredibly caring, consummate professional with a giant heart, and a true friend to all." It added that Perry had been a "father figure and mentor to the show's young cast." Perry's prolific acting career includes his extensive work as a voice actor. His famously husky voice has been part of animated series that range from The Simpsons and Biker Mice From Mars to Johnny Bravo. Perry also made headlines in October 2016, when he greeted his 50th birthday by appearing on the cover of AARP's magazine, along with the headline, "Welcome to the 902-5-OH."